Alpine Travel’s main corporate objective is to run a safer operation and reduce exposure to risk within it’s bus and coach operations. 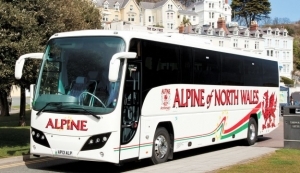 Llandudno-based Alpine Travel is the largest independently owned bus and coach operator in North Wales. A family business with around 145 vehicles, it runs buses on local authority school contracts and remainder the remainder of the fleet is made up of coaches employed on a mixture of private hire, tour and excursion work, including vehicles chartered to tour operators. It also operates open-top sightseeing buses on the Llandudno & Conwy tour, as well as a selection of vintage coaches. Also, as a member of the Confederation of Passenger Transport, and Coach Marque, Alpine is a keen supporter of People 1st, the sector skills council for hospitality, passenger transport, travel and tourism. Alpine Travel’s main corporate objective is to run a safer operation and reduce exposure to risk. This is what prompted Alpine Travel to investigate what GreenRoad had to offer, says general manager Jason Beattie. “We also wanted to cut fuel consumption and reduce the wear and tear on our vehicles,” he explains. Having decided to go with the GreenRoad solution has now deployed GreenRoad’s full driver behavior and fleet performance suite across its entire fleet. Since deploying Alpine has seen a reduction in accidents, and own-fault accident damage. Alpine’s fuel consumption has also fallen along with vehicle wear and tear. “Generally the drivers were positive, although some were initially skeptical,” Beattie stated. “However their skepticism was soon overcome. Two drivers got down to a safety score of just one, one scored two, five scored three, two scored four and four scored five,” Beattie reports. Such dedication to high driving standards has led Alpine to develop an incentive program. “We have a bonus scheme that allows drivers to earn extra income every month, and half of that potential bonus is related to their GreenRoad performance,” Beattie explains. Alpine runs an in-house training school that, along with GreenRoad, helps ensure that the high standards set by its driving workforce are maintained. It has now virtually completed a program to train all its drivers so that they meet the requirements of the Certificate of Professional Competence: the CPC has become a mandatory qualification for all bus and coach drivers since September 2013.